In the landscape of political philosophy today, one is fairly hard-pressed to find any serious consideration of the significance of the divine. Dismissing it as absurd or at least unknowable, there is instead a turn to the exclusively “human things,” as though they could be separated from considerations of anything transcendent. 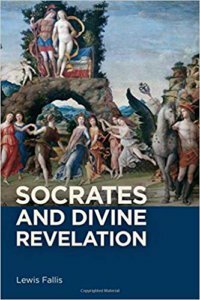 Lewis Fallis’ new book Socrates and Divine Revelation argues a key question in Plato’s dialogues is in fact that of the relationship between morality and divinity. Responding to the claims of relativism and scientism, Fallis argues the possibility of such a relationship remains philosophically valid and worthy of serious consideration. To this end, Fallis turns to Socratic dialectic and how it reveals the nature of this relationship. Fallis does this through examining two seemingly unrelated dialogues, the Euthyphro and the Ion. Fallis’ choice of the Euthyphro is more obvious. As Fallis notes, “it is the only Platonic dialogue devoted solely and explicitly to that theme [of piety]” (22). In the dialogue, Socrates meets Euthyphro on the porch of the King. Socrates is there to hear his indictment from Meletus, while Euthyphro is there bringing his own indictment against his father for murder. Socrates questions Euthyphro, who claims to have unique knowledge of divine things, and therefore whom Fallis considers to be “the Platonic representative of piety” (50). Of his insights into the Euthyphro, one is particularly striking. Fallis reads, beneath the irony of Socrates’ description of Meletus, two serious but competing accounts of the statesman. In the first, Meletus goes to the city as to a mother. Here, Fallis notes, Meletus is equal to all the citizens, and the city is elevated (26). In the second, Meletus is a farmer, raised above all the citizens, and the city itself (ibid). Fallis argues that the relationship of the individual to the city is in some way reflective of the relationship of humans to gods—the gods could be above all human beings, or below, such that “we use the gods as our tools or even as our slaves” (73). Euthyphro, Fallis argues, rejects the possibility the gods could be used by, and therefore, below human beings, and similarly desires they not be so elevated that they cease to care for humans, because he believes in the gods’ nobility (74). He weaves the account of the city into the discussion of piety, showing how divine things, and divine revelation, are deeply intertwined with political questions. Fallis argues that although Euthyphro’s attempts to define piety are continuously rejected by Socrates and the dialogue ends with no clear definition, the discussion shows a concern by Euthyphro for both moral knowledge and knowledge of divine things (78). Fallis argues Plato’s Ion in some way completes the argument of the Euthyphro by showing the experience of a “typical believer” (82). The Ion follows the conversation between Socrates and the rhapsode, Ion, who has just won a competition for reciting Homer and claims to interpret Homer better than anyone (530d). The emphasis of the conversation is on whether the rhapsode is best able to interpret poetry, and if so, why this is the case. This leads to an account of the rhapsode as, like the poet, being divinely inspired by the Muse. Fallis describes the dialogue’s question as “how does one determine the genuine divinity of a text” (85). Fallis argues there are two related parts of this art. One is that the rhapsode maintains mindful judgement alongside the mindlessness caused by divine inspiration (104). The other is that the rhapsode must be a knower of moral things in order to determine if a text is divine (101). Fallis’ focus on Plato’s Ion for the question of piety and morality is particularly good given that, as Fallis notes, Plato wrote dialogues rather than treatises. The literary form that Plato embraces points to the importance of a more poetic approach to the pursuit of philosophy. Helpful to this end is Fallis’ clear account of the significance of mindful judgement even in light of divine inspiration. While something might be beautifully and seemingly divinely presented, it cannot be taken as is, but must allow for and move someone towards mindful judgment. While Fallis certainly points to the importance of poetry for philosophy in his investigation of the Ion, this could be taken further. Fallis differentiates between what is “stylistically or aesthetically beautiful” and the noble, separating the aesthetically beautiful from to kalon. This leads to Fallis’ broader distinction between the beautiful and the noble, a distinction which does not seem particularly clear from the text. Instead, the use of to kalon in the Ion suggests an attempt to reveal the moral and divine substance in stylistically and aesthetically beautiful things (see, for example, 531a, 534e, 542b). That is, that things are made beautiful by their presentation of justice and their relation to the divine. There is perhaps an even greater relationship of form and content than Fallis draws the reader’s attention to. It would be interesting to see a deeper exploration of the relationship of poetry and philosophy. At the end of the discussion on the Euthyphro, Fallis writes, “Socrates’ final lament serves at any rate to emphasize…that his interest in the gods was intimately bound up with his desire to know how to live, and to live well” (81). This point is of particular note in relation to Fallis’ presentation of the Socratic thesis in both these dialogues, that “only the knower of the moral matters could judge a thing to be divine” (145). Fallis’ interpretation of the end of the Euthyphro pushes this thesis even further. Not only does one’s knowledge of moral things leads to knowledge of divine things, but also the reverse. Inquiry into the divine illuminates the human things, allowing one to better know how to live well. Fallis emphasizes this question is not only of theoretical import, but also of political and practical consequence (23,81). Nevertheless, with his comments on how Socrates ends the discussion with both Euthyphro and Ion, Fallis suggests that Socrates’ concern is directed to himself (80,134). It, is, however, Euthyphro who runs away from Socrates (Euthyphro 15e). Similarly, in the Ion, what makes Socrates’ references to the Homeric passages, that Fallis aptly draws out, so noble is not the concern for one’s own good, but for that of others (535b,537a,539a). Perhaps, then, Socrates’ discussions with Euthyphro and Ion are not for Socrates’ education alone, but also for the good of his interlocutors. In keeping with Fallis’ thesis, Socrates pursues knowledge of the gods not for himself, but so that he might become a more truly moral person. Fallis concludes that Socratic dialectic can never lead to knowledge on this question in the strict sense (145). A more holistic consideration of the dramatic form of Plato’s dialogues, including Socrates’ motivation to talk to his interlocutors, might offer a more certain way forward. Of great advantage to Socrates and Divine Revelation is Fallis’ close reading of the texts. Plato’s words are always present to support the argument. Even if the reader disagrees with Fallis’ interpretation, it is very clear where such a reading came from and the argument never feels miraculously plucked from the air. In this way, Fallis’ book is not only a good exploration into an important question in the Platonic corpus, but also lays the foundation for future inquiries. It is a helpful text for anyone interested in the role of the divine in political philosophy. Catherine Craig is a doctoral candidate in Political Science at Baylor University. She received her B.A. in Great Books and Political Science from St. Thomas University in Canada. Her research interests include classical political philosophy, specifically Plato; politics and literature, art, and film; and the history of philosophy.